Imam Dr. Salahuddin Mustafa Muhammad a student of Islam since 1964 has developed into a very profound Islamic leader and propagator of the Islamic Religion within the Mid-Hudson Valley region and throughout New York State. Imam Muhammad has received his Doctoral degree in Islamic Studies—Christian/Muslim relations from Hartford Seminary, a Masters degree in Theology and Counseling from New York Theological Seminary, and a Bachelor's degree in the Social Sciences from SUNY at New Paltz. He has also received a Graduate Certificate in Islamic Chaplaincy from Hartford Seminary. Imam Muhammad has a Certificate in Clinical Pastoral Education, and has completed hundreds of hours in Islamic studies and training from the Islamic Teaching Center in Indiana, where he has received certification in Imam training, the science of Qur'an, and many other Islamic sciences. He has also been a student of the late contemporary Islamic leader Imam Warith Deen Mohammed. Imam Muhammad was employed as a Muslim Chaplain for the New York State Department of Correctional Services since 1985, working in maximum, medium and minimum security prisons, county jails, as well as a psychiatric center. As a Muslim Chaplain, Imam Muhammad has propagated Islam with such intensity, and clarity that Allah has blessed many people to embrace Islam. He has since retired and now lives in Raleigh, North Carolina. In 1986, Imam Muhammad became the resident Imam of Masjid Al Ikhlas, (formally Masjid Al Jihad Al Akbar), presently located in the City of Newburgh, where he was known for his ‘DO IT NOW’ attitude and zeal for establishing Islam. As a Muslim leader, he is known for his active and hands-on role in battling drugs, crime, gang violence, and prostitution within Orange County and the Mid-Hudson Valley region. Imam Muhammad is a member of numerous affiliations which include: The Mosque Cares, the Association of Muslim Chaplains, The MidAtlantic Sectional Majlis,The Muslims for Social Justice, the Islamic Society of North America and Muslim Alliance of North America. Imam Muhammad was the Amir (Leader) of the Mid-Hudson Valley Majlis. He was the first Muslim Chaplain hired by a college in the United States of America (Bard College 1996); and he has worked as an adjunct professor for Mercy and Marist Colleges. He is also on the lecture circuit teaching and explaining the religion of Islam. Imam Muhammad is currently working as an Associate Imam at the As Salaam Islamic Center in Raleigh, North Carolina. Imam Muhammad believes in inter-faith dialogue and cooperation, he is a bridge builder who is constantly breaking down barriers that exist between Jews, Christians, and Muslims. He believes we all should be able to live together in peace. Imam Muhammad is the recipient of the 2010 Human Rights Award from the Orange County Human Rights Commission. He has also received the Imam Umar Abdul Jalil Award for Spiritual Leadership from Citizens against Recidivism, October 30, 2009. He has received Proclamations and Certificates from the New York State Senate, Mayor of the City of Newburgh, Congressman and the County Executive of Orange County, New York. These Awards were for Exemplary Service as Imam and Leader in the community. 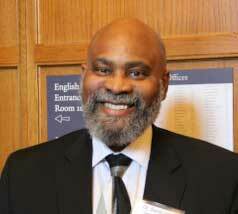 Imam Muhammad was the President of Newburgh Community Action Committee, he is presently the President of the Alumni Council of Hartford Seminary.and is on the Advisory Council of Fortune Society in New York City. He has made the Hajj to the Holy City of Mecca in 1990 and then again in the year 2000. Finally, Imam Muhammad is a proud husband of his dedicated and supportive wife, Fonda, father of four beautiful sons, and a lovely daughter, and has eight lovely grandchildren. As a firm believer, Imam, husband, father, and propagator of Islam, Imam Muhammad, has indeed grown to become an excellent example of how a Muslim should imitate Allah Ta’Ala’s example for humanity, and that is Prophet Muhammad (Peace be upon him).